Piano is a great instrument for anyone to start music lessons on and a fundamental tool for all instrumentalists, singers, and songwriters. It provides a strong foundation for reading music, manual coordination, and ear training all at the same time. Students will learn basic keyboard orientation and simple melodies. We encourage parents to stay for this class to learn alongside their child. Joining them provides support for better practice at home, an understanding of what the child is learning and great conversation. Each student will have his/her own piano in the classroom. 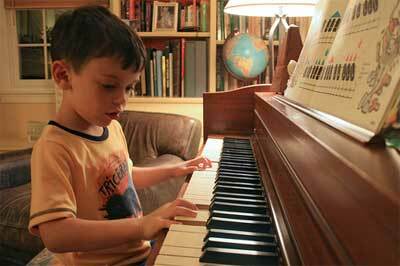 Electronic keyboards are available for rent if there’s no piano at home. Students can join Beginning Piano at any time. Often students entering a class will take a private lesson or two with the instructor to catch up or fill in knowledge gaps before joining the group.